Here updating complete list of qatar VACANCIES daily. Interested candidates. 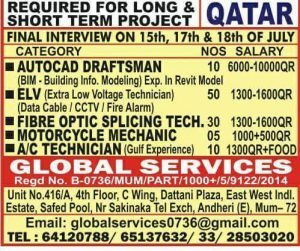 Check their relevant jobs vacancies in DOHA QATAR . 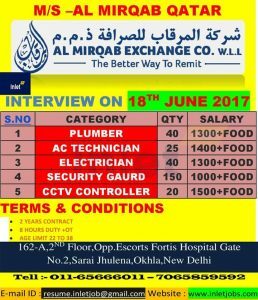 Job Vacancies in doha Qatar,Immediate Hiring for Safety Officer Position. Candidate who is interested to work at Qatar should require min.5 years of Gulf Experience and NEBOSH certificate.Provide Free Food and Accommodation. R.P.Road,Nr.Gurudev Hotel,Above Indian Overseas Bank,Kalyan(w),Thane District,Mumbai. I’m going to serve you this service inspired.I got very good to join you.